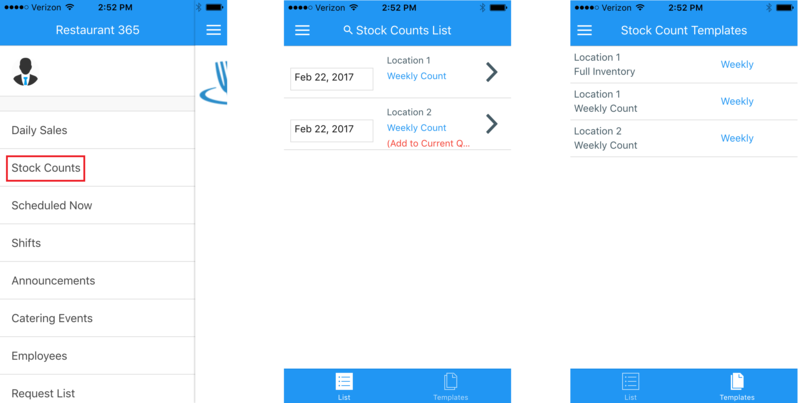 Stock Counts (Inventory Counts) are essential in the Restaurant365 Operations Module. Through the use of Stock Counts, Users can obtain an accurate snapshot of the inventory in their restaurants. A completed Stock Count becomes the Inventory Journal Entry in the Accounting Module with the distribution being calculated automatically and recorded on the Stock Count. Additionally, the quantities entered on Stock Counts are utilized in several reports in Restaurant365. Inventory exists in Restaurant365 as Purchased Items, and Recipes. Stock Counts that will be performed are created from Stock Count Templates. All Stock Count related functions reside in the Restaurant365 Operations Module and can be accessed by Users with the requisite security roles. By default, Users with the Security Role of 'Accounting Manager' will have unrestricted access to perform all Stock Count functions including the creation of Master Records (Inventory Items, Stock Count Templates). Users with the Security Role of 'Restaurant Manager' will be able to 'Use' Stock Count Templates to create new Stock Counts, and Save those Stock Counts, but will not be able to create or modify Master Records (Inventory Items, Stock Count Templates). KB: What Items Are Being Counted on My Stock Counts? For Users interested in determining if all of their Inventory Items appear on their Stock Count Templates, follow the steps outlined in this Knowledge Base Article: What Items Are Being Counted on My Stock Counts?